*Reprint of Archie's TMNT Adventures #18 with a new cover by Fleetway in-house artist. *This issue was preceded by TMHT Adventures #29. The series continues in TMHT Adventures #31. *The last issue to contain an Archie reprint was TMHT Adventures #28. The next issue to contain an Archie reprint will be TMHT Adventures #33. 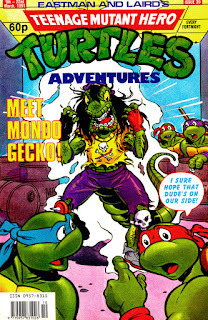 They also used this cover for the European edition of Archie's TMNT Adventures #18 (although the numbering doesn't correlate to the original US series). In fact, several of the UK Fleetway covers as well as their comics ended up in the TMNT Adventures series on the European main land (also titled TMHT Adventures, to make things more confusing). Sometimes the Fleetway comics were used as back-up stories. The only reason why I can imagine they did this, was to sell kids a story in which Shredder actually appeared, as he was still seen weekly in the cartoon show. Most of these stories could still take place within the Archie continuity, although early in the story sequence. Oddly enough, the editors of the European Archie comics (which were situated in Sweden, as I recall) didn't use all of the original US content. Luckily for European readers, most of the scrapped material wasn't that good anyway.